You wanna know the secret to making a delicious Pesto Penne dish? It’s cooking your pasta in Knorr Beef Cube. It makes all the difference! 1 To make a tasty penne pasta, bring a pot of water to a boil and drop the Knorr Beef Cube. Let this simmer for a minute until dissolved. Add the pasta in boiling broth and cook just until al dente. Drain the pasta but don’t wash with water. 2 Grab a pan and make it nice and hot over medium heat. Add the pesto sauce and just throw in the cooked penne. Swirl and toss to fully coat. Serve with a topping of cheese and that’s our dish! 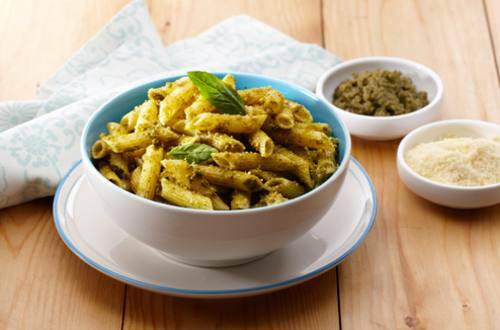 3 Pesto Penne will surely brighten anyone’s day. Imagine the joy you’ll get if you share this with friends and family as well. Something this good isn’t just a one-person dining experience type of dish.